Victory Monument isn’t Bangkok’s most beautiful area, with endless concrete overpasses and bus stations. Despite its lack of natural beauty, it’s home to some great restaurants and a mix of interesting bars on Soi Rangnam. 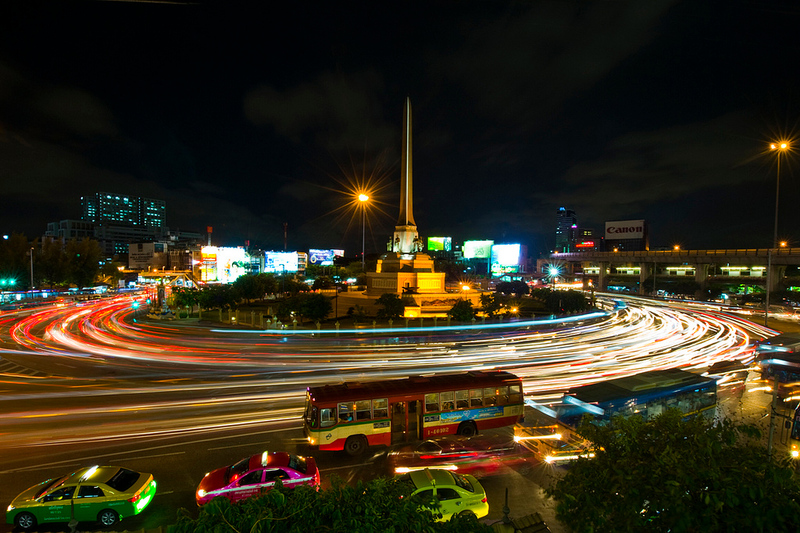 The Victory Monument area is also where you’ll find King Power, Bangkok’s biggest duty-free shopping mall, as well as a variety of small shopping malls, clothing shops, street food stalls and other quintessential aspects of everyday Bangkok life. Built in 1941 to celebrate Thailand’s victory over France in 1940, Victory Monument is a large monument that’s used as a distance marker for Bangkok in maps of Thailand. The monument is home to a popular food and clothing market and serves as a bus and minivan hub. 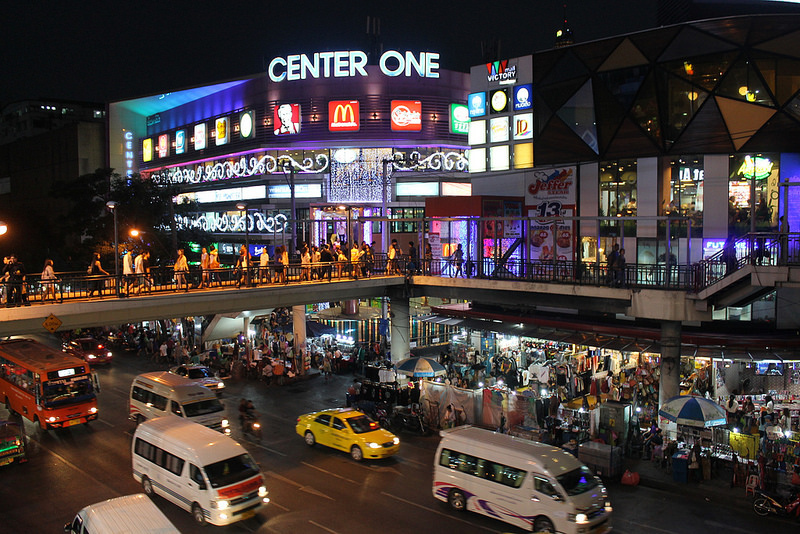 Century: The Movie Plaza is a shopping mall located next to BTS Victory Monument. While it isn’t as impressive as the shopping malls in nearby Ratchaprasong, Century serves as a great shopping hub for the Rangnam and Victory Monument area. Another small shopping mall, Centre One is located on the Victory Monument roundabout. Its myriad small shops offer a wide range of wholesale clothes and accessories similar to what you can find at City Complex or Platinum Fashion Mall in nearby Pratunam. Located on Soi Rangnam, a small street located close to BTS Victory Monument, the King Power Complex is Bangkok’s largest duty-free shopping mall. Prices for brand name goods here are some of the lowest in the city — remember to bring your passport and plane ticket. Bangkok Dolls is a small, somewhat hidden museum located a short distance from Victory Monument BTS Station. In addition to the charming doll museum, there’s a shop offering a range of handmade Thai dolls, all of which are produced on site. Santhipap Park is a small but relaxing park located between Soi Rangnam and Ratchawithi Road. Five minutes from BTS Victory Monument on foot, Santiphap Park fills up with local residents at 6 pm every evening for free aerobics classes. Built in 1909 when Phaya Thai was still predominantly an area of farmland, Phayathai Palace is a beautiful early 20th century Thai palace. The palace, which over the years has served as an international hotel and retreat for King Rama V, is largely unknown to tourists. Located in Din Daeng, the Thai-Japan Youth Centre is a sports complex that’s 10 minutes from BTS Victory Monument by taxi. Facilities include a running track, public tennis courts, gymnastics equipment and a martial arts training facility. A huge selection of wines at relatively reasonable prices (Thailand puts a huge luxury tax on wine so it’s eyewateringly expensive for tourists), Wine Pub is a sophisticated, atmospheric place for dinner which has numerous weekly special deals for dinner and drinks. This open air shopping mall is easy to find: exit BTS Victory Monument and walk towards the monument itself. Located in front of Centre One shopping mall, Victory Point is made up of an assortment of open air food stalls serving fried noodles, soup and other Thai dishes. Although its location is about as unromantic as one can be — Doy Kuay Teow Reua is built alongside a rather dirty canal — this restaurant’s excellent boat noodles, which cost just 15 baht a bowl, bring in hundreds of diners a day. Soi Rangnam is one of Bangkok’s best streets for authentic Thai dining, and Kuang Seafood is undoubtedly one of its most famous restaurants. 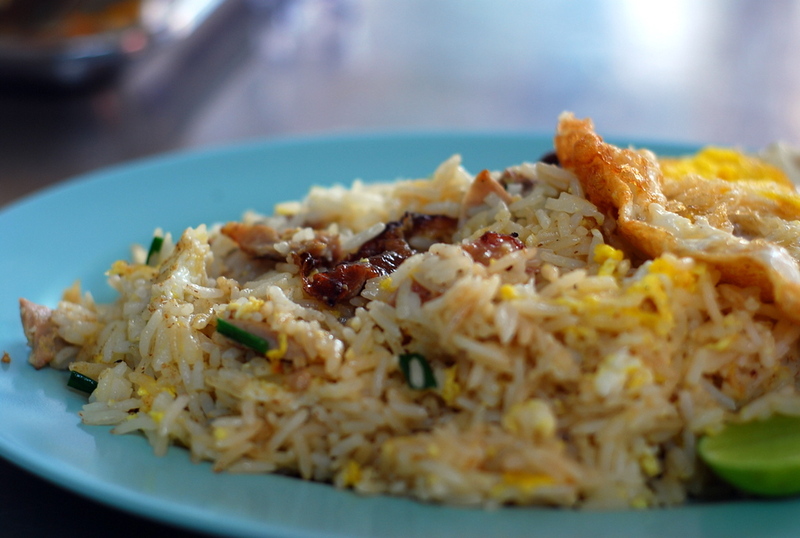 With tanks of fresh seafood visible from the street, it’s impossible to pass by Kuang Seafood without feeling hungry. This small Italian/Thai restaurant is located next to Santiphap Park on Soi Rangnam. The menu is made up of a wide range of dishes, but it’s the authentic Italian pizzas that steal the show, as well as the great range of classic cocktails. Located on the corner of Soi Rangnam and Phayathai Road, Eat Am Are is popular with local university students and Rangnam residents. The menu includes a variety of cheap steaks and burgers, with tables quickly filling up after sunset. Everest Kitchen is a small Indian and Nepalese restaurant located on Ratchaprarop Road, right next to The Complete condo building. The restaurant is small, noisy and crowded with diners after sunset, but the food itself is fantastic and very fairly priced. Step into Soi Rangnam and you’ll quickly spot Tida Isaan — an open air Isaan restaurant right behind Century: The Movie Plaza. Tisa Isaan attracts locals, expats and tourists alike seeking tasty northeastern Thai food. Tida Isaan might have the location, but Isaan Rot Det definitely has the food. Located a little further down Soi Rangnam, Isaan Rot Det serves excellent (and extremely spicy) Isaan food with no-frills service, making it a great choice for lunch or dinner if you’re in the area. Although it’s called Great Grandson Noodle Bar, this quiet neighbourhood restaurant serves a huge variety of Thai dishes. Meals are inexpensive and the juice bar outside delivers to diners inside the restaurant. Located opposite the King Power Duty Free Complex on Soi Rangnam, Bean Around Café is a small local café that’s popular with Rangnam residents. Open from 7 am, it’s one of the few cafés near Victory Monument to serve breakfast. A favourite of Thai street food gurus, Baan Pa Jazz is a tiny restaurant hidden on Ratchawithi Soi 7 (accessible from Ratchawithi and Soi Rangnam). Pa Jazz cooks a great variety of Thai dishes at reasonable prices, starting from 10 am daily. Located in the King Power Complex on Soi Rangnam, the Pullman Bangkok at King Power is Victory Monument’s only five-star hotel. This quiet and luxurious hotel has a rooftop swimming pool, fantastic day spa and one of Bangkok’s best wine bars. This small three-star hotel is located right beside Santhipap Park, making it a relaxing place to escape the noise of Victory Monument itself. Ask for a room on one of the higher floors for an excellent view of the city skyline in Phaya Thai and Ratchaprasong. Century Park Hotel is a comfortable four-star hotel located about 10 minutes from BTS Victory Monument on foot. Rooms are spacious and the hotel’s swimming pool highly relaxing, but its location next to a major flyover means that rooms on the lower floors can be noisy. The True Siam Hotel is a quiet, comfortable three-star hotel hidden on Sri Ayutthaya Soi 12, just a couple of minutes from BTS Victory Monument. A short walk to street food and great restaurants on nearby Soi Rangnam make this hotel a convenient, low-cost option. The Bizotel Bangkok is a simple, minimalistic and functional three-star hotel on Soi Rangnam just five minutes from BTS Victory Monument. The hotel is a short walk from Santiphap Park, with a variety of restaurants and street food vendors nearby. 21 Living Place is a serviced apartment located on Soi Rangnam, less than five minutes from BTS Victory Monument. Furnished rooms, free Wi-Fi and a convenient location — along with discounted weekly and monthly rates for long-term guests — make it a good choice. HI.Mid Bangkok Hotel is a short walk from BTS Victory Monument. Surrounded by great cafés and restaurants, this budget hotel offers dorms and private rooms, making it a good choice for budget travellers that want to be close to public transportation. Located on Soi Rangnam a short walk from the King Power Complex, Baan Bar is a small but hugely popular bar within easy walking distance of BTS Victory Monument. Drinks are strong and inexpensive, making this a favourite of local residents and expats. Raintree is a live music pub on Soi Rangnam that specialises in Thai folk music. With interior decorating that makes it feel more like a 1970s living room than a local bar, Raintree attracts a crowd of locals and expats seeking fun live music and no-frills drinks. Although there’s not much jazz on offer — live music is normally 90s alternative rock covers — Skytrain Jazz Pub is one of Rangnam’s best live music bars. Located atop a small shophouse close to the BTS, getting up the five flights of stairs is quite a journey, but the view is worth it. 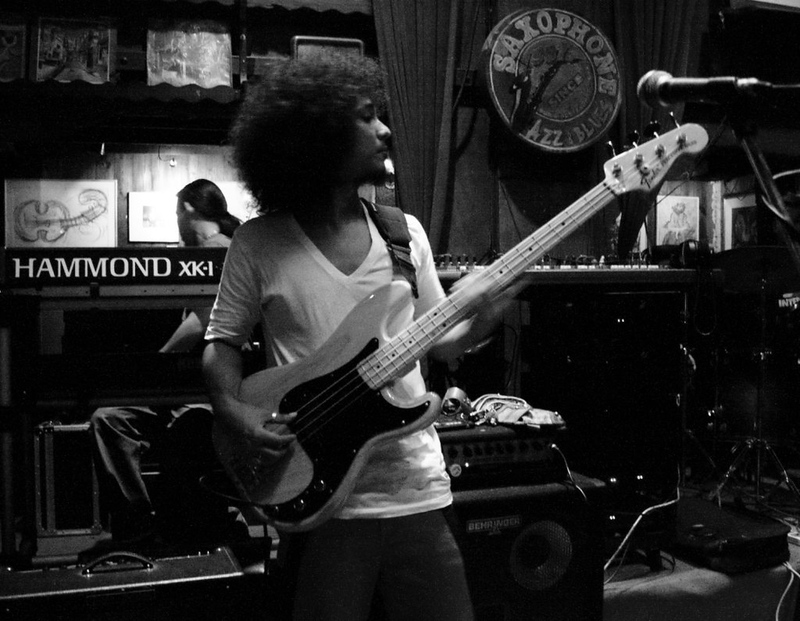 Saxophone is one of Bangkok’s best live music bars. With live performances by the house band and guests, Saxophone’s combination of great drinks, classic Thai food and live jazz, rock and blues makes it one of Victory Monument’s best nightspots. Bangkok might not be the best city on earth for wine lovers, but Wine Pub — a great wine bar located inside the Pullman King Power Hotel — is undoubtedly a fantastic place to try a huge range of wines from around the world. The Victory Monument area is easy to access using the BTS Skytrain. 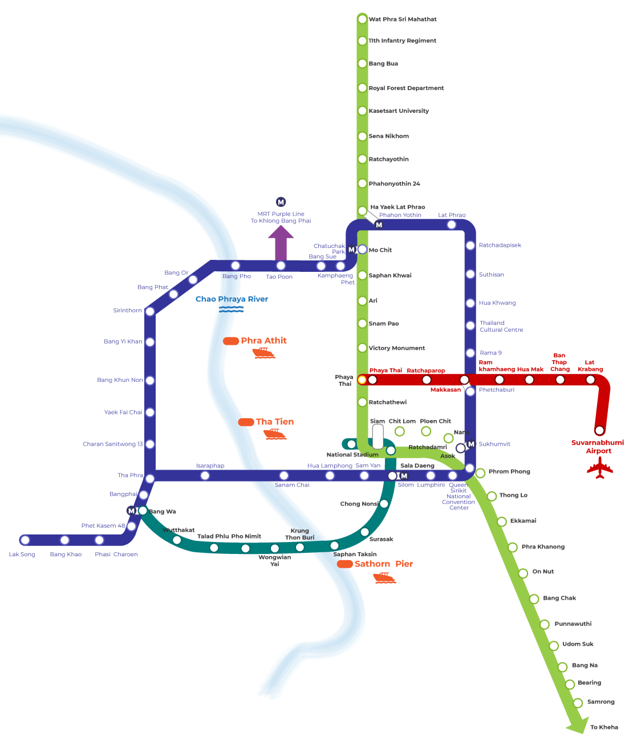 From BTS Siam, take the Sukhumvit Line towards Mo Chit and exit at Victory Monument Station. A large skybridge connects all sides of the monument with the BTS Skytrain station.